Data structure diagram (DSD) is intended for description of conceptual models of data (concepts and connections between them) in the graphic format for more obviousness. Data structure diagram includes entities description, connections between them and obligatory conditions and requirements which connect them. Data structure diagram is a subspecies of the “entity-relationship” diagram type (ERD). Entities in data structure diagrams are presented in the form of rectangles or rounded rectangles, and connections between them in the form of arrows. The description of an entity is usually placed inside the rectangle, which denotes the entity. The text description of the entity requirements connecting entities is placed near the line which denotes the connection between entities. The description of connection types between entities (one-to-one, one-to-many, etc.) can be different in different notations and differs with the arrow type on the line of connection between entities. The most famous are notations of DeMarco, Jackson and Yourdon. DSD also used for hierarchical presentation of the complicated entity. Such data structure diagram is usually created in the result of entity decomposition to the set level of detailed elaboration and presented as a tree. The difference of the data structure diagram from the “entity- relationship” diagram is that DSD more completely defines connections and relations between elements of entities whereas ERD defines connections between entities. ConceptDraw DIAGRAM v12 JECT is an effective tool for new and experienced users with a fine balance of usability and powerful functionality. Diagrams are a very important part of modern life. With the help of flow diagram software, a lot of companies can promote their ideas at the market. Its usefulness is totally doubtless. This is a flow chart of the invoice payment flow. This flowchart details decrypts all stages of the process of obtaining and paying bills. It is a description of the universal process - such steps performs accounting departments of almost any organization. Since every business no matter what it does is a consumer of some goods or services. The given flow chart was made using ConceptDraw DIAGRAM v12 software and the What is a Diagram solution for making flowcharts of any kind. Accounts Payable Flowchart - There is nothing easier than do it in ConceptDraw DIAGRAM v12 ConceptDraw DIAGRAM v12 diagramming and vector drawing software provides the Accounting Flowcharts Solution from the Finance and Accounting Area of ConceptDraw Solution Park. The Accounting Flowcharts Solution contains templates, samples and library of ready-to-use predesigned vector objects that will help you create: accounts payable flowchart, accounts payable process flow chart, accounting flowchart of any complexity quick and easy. Program Structure Diagram - The Software Development solution from ConceptDraw Solution Park provides the stensils libraries of language level shapes and memory objects for drawing the structural diagrams of programs and memory objects using the ConceptDraw DIAGRAM v12 diagramming and vector drawing software. The vector stencils library Activity diagrams from the solution Rapid UML contains specific data modeling symbols for ConceptDraw DIAGRAM v12 diagramming and vector drawing software. The Rapid UML solution is contained in the Software Development area of ConceptDraw Solution Park. A database is a data collection, structured into some conceptual model. Two most common approaches of developing data models are UML diagrams and ER-model diagrams. There are several notations of entity-relationship diagram symbols and their meaning is slightly different. Crow’s Foot notation is quite descriptive and easy to understand, meanwhile, the Chen notation is great for conceptual modeling. An entity relationship diagrams look very simple to a flowcharts. The main difference is the symbols provided by specific ERD notations. There are several models applied in entity-relationship diagrams: conceptual, logical and physical. Creating an entity relationship diagram requires using a specific notation. There are five main components of common ERD notations: Entities, Actions, Attributes, Cardinality and Connections. The two of notations most widely used for creating ERD are Chen notation and Crow foot notation. By the way, the Crow foot notation originates from the Chen notation - it is an adapted version of the Chen notation. Bureaucratic companies usually are characterized by a strict hierarchy and clearly defined responsibilities. However, sometimes organizational structure of a company reminds of somewhat tangled. To clarify it, you can create an orgchart that will represent the company as a tree with its' departments as branches. This organization diagram represents a tree-like organizational structure. This is a typical example of a top-level branches of the hierarchical organizational structure. This part of the tree shows heads of branches who are subordinated completely to the president. The information and solutions are distributed though a tree structure down to the company's departments. Each of the sub-division has its own structure that is reflected in the corresponding organizational chart. 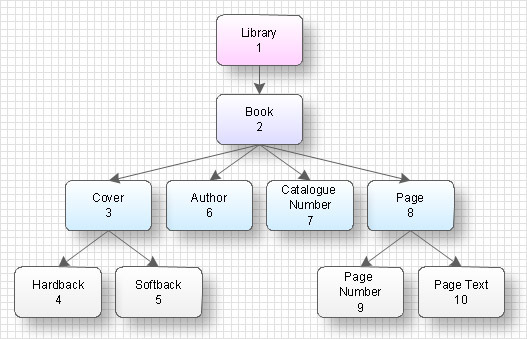 This orgchart diagram was created using the vector graphic library supplied with ConceptDraw Organizational Charts solution. IT world is extremely rational and logical. So what can be more precise than Software Diagrams to rate the results of work? Visual statistics is the best way to understand the data. This figure demonstrates the data flow diagram (DFD), which was created to describe the electronic system of custom purchase. This is the process of buying using electronic bar code scanning system. Such systems are used in large stores. The cashier scans the bar code, the system outputs the data on the price of the goods and carries out a purchase process. This DFD utilizes the Gane/Sarson notation. To create it The ConceptDraw DFD solution has been applied.